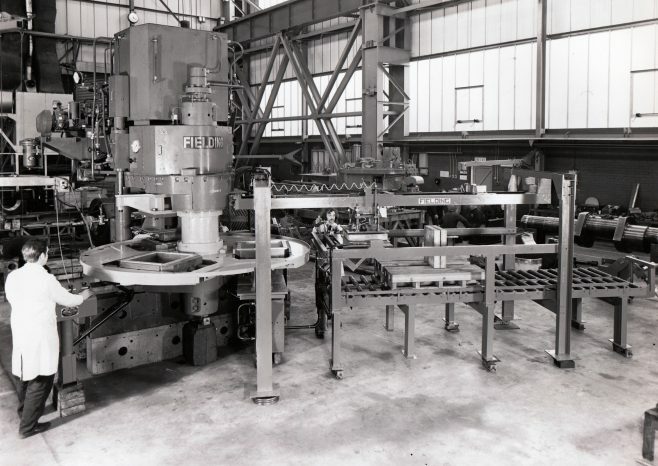 This press came to our family company Jaren Cementvarefabrikk and was in operation during 20 years making slabs 300 x 300 mm (duplex) and 500 x 500 mm. We sold the company in 1985 and the slab plant ended up with St. Eriks as owners and was closed down in 1992/3. St. Eriks is Swedish and had several wet presses. Our press ended at a storage in Vara, Sweden, where I saw it for the last time in 1998. We bought another press from Fielding and Platt in 1980; that was a single mould press with an automatic take-off device. It was painted in green colour and I could send you a picture if you like. That press was sold back to Alexandra Stone in UK some 5 years later. I am the last one alive among the owners and I was busy in the company from 1965 until it was sold. When ordering the 3 mould press in 1971, I did visit Gloucester together with the director of the financing Norwegian bank! Hi John! Nice to see Bob Blowers in this photo, standing by the take-off unit. I can’t quite work out who it is at the controls, likewise the three guys in the background to Bob’s left. The moulds look to be a bit deeper than standard ones and so I assume that they were specials. To return to the ‘operator’ it could be John Mabbett, I know he worked on a lot of ‘stone plants’ over the years. Chippy Aston. Hi Chippy! You are quite correct identifying Bob Blowers. I am sure that the operator is not John Mabbett as he was much taller. My thought was that it could be Pete Skelton.